If you value having good health, you’re going to stop at nothing to keep yourself in peak condition as much as possible. This means watching what you eat, exercising, taking proper supplements, and maintaining a mental well-being. When you get down the real nitty-gritty, there are also factors such as air pollutants, the moisture levels of the air you breathe, and aromatherapy. If you’re more concerned with the latter of those options, then this Aroma Diffuser Woody Ball might be a product worth looking into. This is a rustic looking sphere that harkens back to milk glass lamps and solid wood aesthetics. 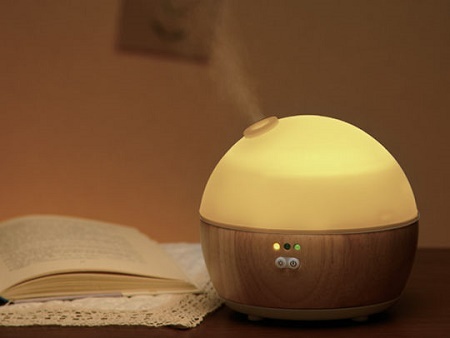 This will not only act as a light source, but will provide you with an aromatic mist as well. There are options for one, three, and six hours periods of diffusion, and you only need to plug it in and pick the length of time to get things going. This comes in three different versions. There is natural, brown, and white, while the dome stays the same in coloration. If you want the house to smell a certain way, you’ll need to purchase your own aromatic oils and place this strategically to get the most out of this little device. This is going to cost you around $89, and that’s assuming you don’t already have essential oils to use with this.